I live in a senior community, mobile home park and have convinced the owners to allow a community type garden in one of our empty lots. I'm hoping to convince some of these long time "long row" gardeners that SFG is the best way, especially in our limited space! I've been working on this project since March. The old mobile home was finally pulled out, now the leveling has been finished and the layer of rock is being spread just in case some potential new home owner wants this particular lot. When it's all ready we can begin building the boxes and finally grow something! The soil will be provided so now I have to convince the owners that I want Mel's Mix!! 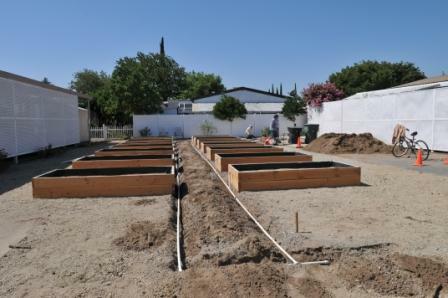 I'll try to post pictures of the project as it evolves...but at the rate we're going, it will be winter crops! 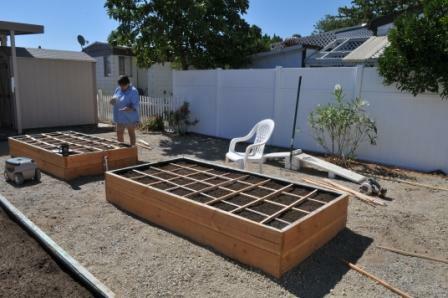 We're all excited because the wood arrived to build 12-4'x8' garden boxes and we're well on our way putting them together. Our small garden group will meet on Wednesday evening to see what happens next. Hopefully the soil being provided for us will arrive next week. We're all so anxious to get growing! That's so exciting! Please post pictures when you can. We've been taking pictures as the lot was cleared, gravel delivered and then leveled, and now as the boxes are beginning to appear. The neighbors all keep stopping to chat so it makes the process longer, but that's part of the idea...neighbors getting to know one another better. We'll get the pictures up later this week! You had a great idea about the community garden. Can't wait to see your photos. I missed your original post, so here's a belated welcome to the forum. That is very exciting. Do keep us informed. It is amazing how a garden brings more than plants to life. Congratulations on the wood and the progress. It sounds like the project is already growing friendships. Can't wait to see the pictures. It is 9:08pm, Tuesday night. Al and I just forced our legs up the steps to our front door. We are soooo exhausted. Today we put together the last of the 14 garden boxes...well, we still need the second tier on 6 of them. After pre-drilling 3 holes on the ends of each board, then screwing the sides together (in our shaded driveway!) we picked up each frame and walked it to the lot next door. Al finished leveling all 14 bottom frames- front to back, side to side. We then turned each bottom frame upside down and stapled weed barrier cloth on it, then carefully turned it over again and stacked the second tiers. We'll finish screwing the 6 remaining second tiers tomorrow. Did I tell you that we live in a Senior Community?? We're over 60, and our neighbors are standing around watching us because most of them are over 70! We had an unexpected surprise just after noon...16 yards of soil were delivered and dumped on the driveway of the lot next door. Well, that's a "good thing" but now we're trying to find neighbors with grandsons who will come and haul it to each garden box! On Monday we'll probably have the PVC pipe delivered to set up our watering system. The plan is to have a spigot at each garden site. Cross your fingers! OK, enough for now...gotta go find that bottle of extra strength whatever to soothe my aching limbs, not to mention my sunburn! I hope you survived the night and it isn't worse today! Wow! God made young men specifically for hauling dirt. I am sure you can find some around (call in the Scouts!). What a great project! @Chopper wrote: God made young men specifically for hauling dirt. I am sure you can find some around...! You have made great progress! I bet you were sore after all that work. Congrats! Talk about sore! Today was much more work. The group out-voted me and decided the boxes should first have Kilz put on the inside to protect the Douglas Fir, then it was painted...and then it was to have black plastic attached around the inside walls to prevent any chemicals from leaching into our soil. (overkill???) Hmmm, guess what? Nothing sticks to black plastic! I suggested we use some furring strips placed just under the inside top edge, folding the plastic back over and inside with a bead of silicon to keep the water from getting between the plastic and the insides of the walls. This is just entirely tooooo complicated! Anyway, after a bit of a challenge getting the strips of black plastic liner cut (plastic was 10'x25' and we used 18"x25' strips) we finally got 6 of the darned things completed before I mutinied and went in the house to fix dinner. 92 degrees out there in the garden site at 7:30pm is more than I wanted…I was done! Soooo, tomorrow DH and a neighbor will complete the remaining 6 frames while I take a nice trip out of town. We had the ¾” PVC and all fittings delivered today for our water system. We’ll put that together on Thusday and hopefully start filling the boxes with the dirt sitting on the driveway. Now who in the world thought this project would be something cool to do?? Oh yeah, that would be me…LOL! PS We’ve tried to post some pictures but no luck yet. Boffer very nicely posted one from the personal gallery of OutsideEasy…yep, that’s my DH!! We started working on the water system yesterday... as in digging the two 65' trenches on each side of our center 4' walk. Each of the 14 boxes will have a water faucet, including a shut off ball valve for emergencies. This way the entire garden site won't do without water if one gardener accidentally breaks their hose fitting...nice safety feature for a group garden. Yesterday Al and I added the last of the dirt to the boxes and leveled them to within 6" of the top of the boxes. Today the manager of our Senior Park will deliver bags of something like Miracle Grow soil to finish. Al and I will be using our own stuff, my garden box will have entirely Mel's Mix for the top 6-8". This is way more work than I anticipated but the amount of neighbors stopping by to either chat about gardening, or add .02, or to actually lend a helping hand is amazing. Last night one of our 80+ yr old neighbors got off his bike, took off his helmet and grabbed the extra shovel. He worked for an hour helping Al finish the last of the trench and he was back bright and early this morning to help out again. I love reading this thread. I enjoy all the stories, told very well ! Im over here cheering for you from Southwest Mississippi !!!! Really! What a great (if overdone LOL) project. But no worries about wood rotting. I am driving with my son's family from Sacramento to San Diego on the 5th. Wonder if they would be interested in a side trip? Perhaps with 2 kids under 3 that would not be the best idea. Can't wait to see them completely set up. Hey Chopper! We'd love to show off our project, yes, our overdone project...but ya know, that wood will never rot! If you are on I-5 we're out of the way, but if you stay on 99 from Sac to Modesto we're less than 10 min off the freeway. With a 15 mile backtrack you could be headed on over to I-5 to go south again. Getting to meet you would be such fun! Our water system is almost ready! 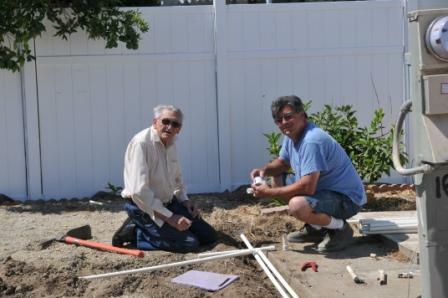 Al and good neighbor Joe finishing the water system. Did I say Joe is 90 yrs old? What a worker! Al got wet testing the system! Al and Joe covering the trenches...all works well, no leaks! Just awesome !!!! simple beautiful, I love seeing these !!!! 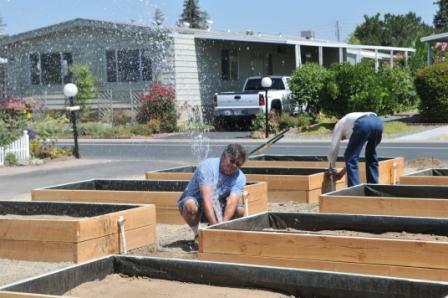 We've been really busy this past week getting the garden boxes finished for each gardener to begin planting. 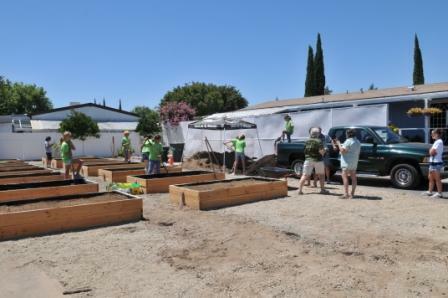 On Thursday Al and one of our gardeners drove pickups out to the City of Modesto Compost Facility to get 2 cu yards of beautiful compost...buy one cu yard for $15.77 and get one free. Luckily a local youth group had been lined up by another of our gardeners to help us shovel the stuff out of the pickups...(Al, my DH had moved almost all of the original pile of dirt into the boxes and just didn't want to do it all again). The kids worked hard and fast and I served them ice cold lemonade. The City recommended half 'n half with the compost and our remaining dirt so Al parked his wheelbarrow between the two piles, under the EZ-Up shade of course, and began one shovel of this and one shovel of that...and yes, he again filled almost all the garden boxes. 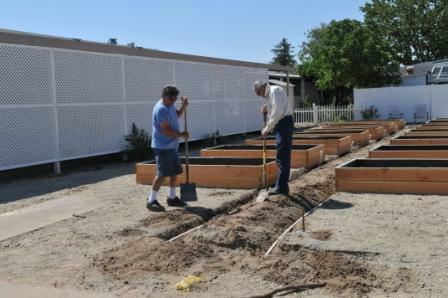 A few others came to do their own, but since most of our gardeners are well over 70 we just keep on helping them get ready. This morning Al and I sat at our kitchen table with printed out grids and new packages of seeds, deciding what would grow where...what a job! That was almost more difficult than shoveling the dirt! After a few cups of coffee, much discussion, more consulting of the SFG book, and a final deep breath...off we went to plant our garden boxes!! YAY!!! We tried to plant without the grids in place and quickly decided that was NOT the way to do it...so we cut the strips, put them in place and got to planting again. The looks on the faces of some of our non-gardening neighbors who came to see our progress was hilarious! They said "you're gonna plant ALL of that in just that tiny space?!" and then walked away shaking their heads. That's OK...we know it's gonna grow! Soooo, here we are, July 31st and our gardens are starting. Here in the Central Valley we'll have warm growing weather almost until Thanksgiving. We'll post more as things begin to pop up! Wonderful! You have all done a lot of work. Can't wait to see your plants thrive. Hey, you're getting good at posting pictures! Thanks! It's fun watching your progress. I'm glad to see that Al was getting some help from young, strong backs! What do I do now that all the work is done ?